Hope everyone aware about the magazine subscribed by us for our onsite schools. We are in a plan to subscribe the magazines based on the feedback and overwhelmed co-operation/response from the school students and teachers. All these magazines are reaching the respective schools directly and students are utilizing these magazines to study and make them self aware about the current affairs and general knowledge, even in some schools teachers are utilizing these magazines to teach lessons. Since the library and subscribed magazines are utilized properly we are extending our support for all these schools in the upcoming academic year – 2018-2019 also. In this regard, we are inviting all our volunteers and members to contribute in this wonderful action. Total fund requirement – 31860 ( Rs.3186 * 10 Schools). I request all our members to come forward in this regard. They can contribute for one school, even partially is welcomed "Little drops of water makes the mighty ocean". Kindly find the attached image in this regard. Renganathampettai Govt Hr. Sec School is one of our onsite school since 2008. School is located 16 km from Karur town. India sudar provided library and deployed teachers and librarian to this school. Students are from financially downtrodden families. This is one of the best school in Karur Dt. with good progress. India sudar distributed certificates and prizes to motivate the students who are the Best performers, Volunteers, Award winners, Achievers in sports and Library utilisation during Republic day celebration 2018. We thank our member and donor of this work Mr. Rajesh Kanna Janarthanan for his contribution. India Sudar needs your hands to manage the teachers’ salary. All of you know well that because of our teacher deployment project , 100% results are being met by our onsite schools, Library utilisation is well, Computer literacy is good and above all our science teachers are ensuring HANDS-ON SCIENCE to every kid studying in govt. and panchayat union schools selected by India Sudar. The entire credit goes to our members and well wishers who are behind india sudar to fulfill the needs since 2004. No of beneficiary under our Teacher deployment project is 8000 students approximately..
Our request to everyone of you to help us in meeting the shortage of Rs..75,000 to do salary transfer in time. Already we are in middle of a month. Kind request ! Contribute as much as possible. (OTN93) Municipal Middle School, West Colony, B.Komarapalayam, Namakkal Dt, TN. After seeing the photos, you may realise the team work and efforts behind this program. No words to say. Purchase of prize materials (files, exam pads , lunch bags, school bags) to motivate the students -best students, library utilization, academic excellence and 100% attendance during Annual day celebrations 2018 which was held on 16th Feb 2018 and also printed certificates for other upcoming events. Choreography by school teachers. Excellent ! Students performed well and to appreciate their talents audience of 1000 people (parents and people who stay nearby to the school) were present. I attended this event and enjoyed thoroughly (5.30 pm to 10.30 pm). Students performed Folk dances, villu pattu, child labour drama in English, Bharatanatyam, Dandiya, western, rock, instrumental round etc etc……. Classes: 1st std to 8th std , Tamil and English Medium, Student strength: 550 approx. School is located in a town, having talented and dedicated teachers. Power loom weaving is the primary job in this location. Students are from financially downtrodden families. India sudar has been supporting this school since 2016: Library, librarian deployment, teacher deployment, spoken English, SEBLA camp, motivational sessions etc. School has received District Level Best School Award from Govt. Let us keep supporting every move ! It is our pleasure to share the following update from our onsite Govt Hr Sec School, Renganathampettai, Karur Dt, TN. 1. INDIA SUDAR provided financial assistance to students and teacher of Govt Hr Sec School, Renganathampettai, Karur Dt to travel and present the science project titled “Sugarcane farming on the brink of extinction and disappeared jaggery mandis “. This project was selected from District level and the team went to Chennai to participate in state level presentation. School children from 33 districts across Tamil Nadu were selected for the state level event-National Children’s Science Congress at Chennai. The three-day programme is an initiative of the National Council for Science and Technology. We wish to mention that the team was lead by Ms Mahalakshmi, who is India sudar staff. Project report is attached herewith. 2. In addition to the above progress, Ms Shanmukavadivu , Teacher of this school guided a student team and done a project on " Solid waste management and Planned energy usage" in the year 2016 and submitted to the Science City ,Chennai,Govt of TN. The project got selected and won the FIRST PRIZE and "Science academy Award" in the state level. 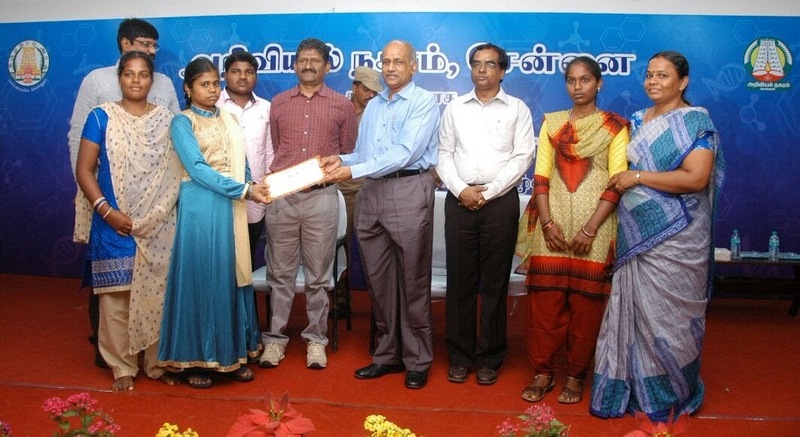 Students were honoured by Thiru U. Sagayam, IAS, Vice Chairman, Science City at Chennai on 28th Feb 2018. Our onsite school – Panchayath Union Middle School, Periyailliam,Kangeyam Block, Tirupur Dt celebrated school annual day 2018 on 16th Feb 2018 at school premises. Audio systems , stage arrangement , Pandal (stall) arrangement were taken care by parents. India Sudar provided Prizes to motivate best performers (in sports, academic, arts etc) studying 1st std – 8th std in this school. I attended this program and also inspected the school to understand the needs. students performed well and the talents need to be appreciated. For more details, please refer the attached project report. We thank our members for the continuous support. We sincerely appreciate the efforts of school teachers and parents community in improving the school. 2. Computers are in working condition. Our India Sudar teacher takes care of computer lab and doing well. 3. Spoken English project is going well,. But needs improvement. It will be taken care in next year. 4. Water sump was constructed by our partner organisation " Helping Minds" . It helps the school a lot. Now no water shortage. 5. Toilets are Ok. Regular cleaning is happening. 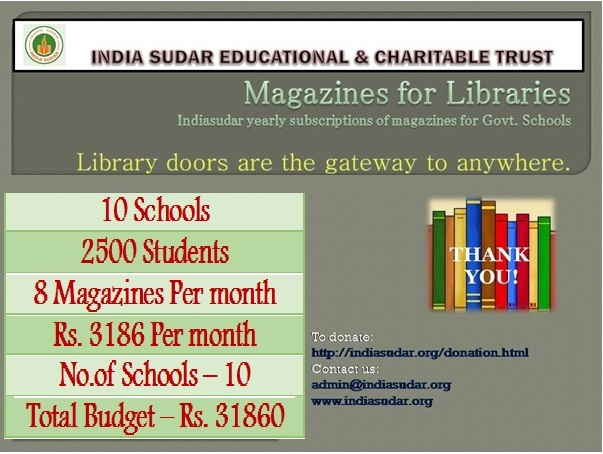 India sudar will keep supporting the Teacher deployment, Library and spoken English project.